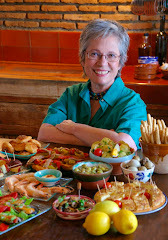 Congratulations to Claudia Roden, whose marvelous book, THE FOOD OF SPAIN (ECCO/HarperCollins, USA), won the IACP award in the international category for cookbooks published in 2011. I am a huge fan of Claudia Roden’s work, starting back in the early 1970s when a friend sent me a Penguin paperback of A BOOK OF MIDDLE EASTERN FOOD. 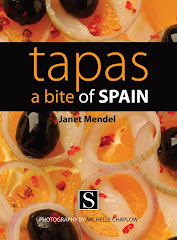 I have made every one of the recipes in the mezze chapter—including Fried Brains—in my kitchen in Spain. 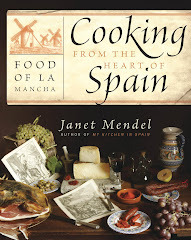 I use Claudia Roden’s THE BOOK OF JEWISH FOOD (Knopf, 1996) to help me track the influence of Spanish cooking in Sephardic communities around the world. So, I was thrilled when she turned her attention to the cooking of Spain. Claudia Roden signs copies of THE FOOD OF SPAIN at a Culinary Historians of New York event last June. 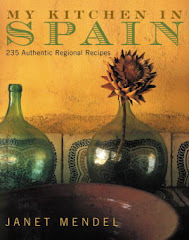 THE FOOD OF SPAIN is a huge book, a tome (at 608 pages, it weighs in at just over five pounds). Photographs by Jason Lowe of both food and places add to the book’s allure. In spite of the size, this is no coffee-table book. Cooks will appreciate that it props open nicely on a bookstand and that recipes really work. My copy already has stains from frequent kitchen use. Size means THE FOOD OF SPAIN has got it all. Despite a cover blurb by modernist chef, Ferran Adrià, the book is really dedicated to traditional regional dishes. Spain’s home cooking. 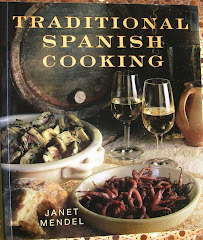 And, traditional Spanish cooking is what I am all about, so this book is dear to my heart. 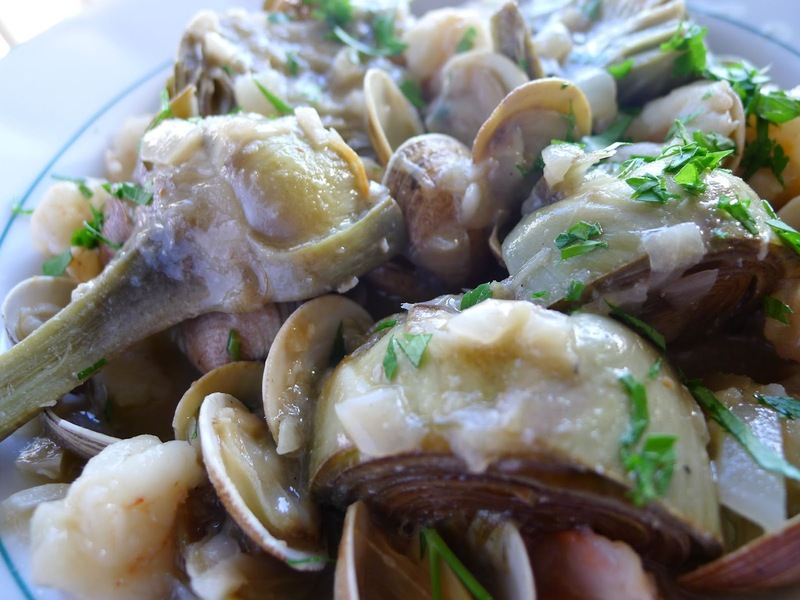 I chose a recipe from THE FOOD OF SPAIN for Artichokes with Shrimp and Clams that is seasonal (spring artichokes) and somewhat different from the version in my own cookbook, MY KITCHEN IN SPAIN (HarperCollins 2002). Claudia adds small shrimp to the dish, making it really luxurious. In the recipe’s headnotes, Claudia writes that she learned this recipe from a chef from Córdoba, who prepared them with fresh-picked baby artichokes. As it is difficult to find baby artichokes and time-consuming to prepare them, she suggests using frozen artichoke hearts or bottoms. In Córdoba, she notes, the dish is made with the local Montilla-Moriles sherry-type wine, but she has also used manzanilla, a fino sherry. I can get those small artichokes in my local market. 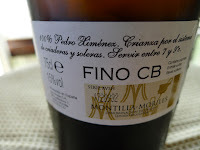 And I just happened to have a bottle of Montilla-Moriles fino from the Alvear bodega. 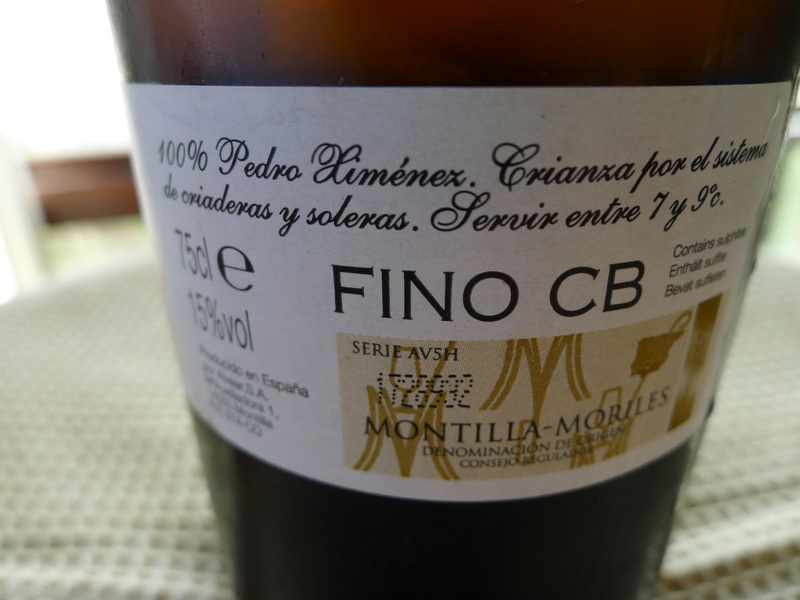 Montilla wines (from Córdoba province) are made in the same way as Sherry from Jerez, but with Pedro Jimenez grapes instead of Palomino. They are very similar in style. I trimmed the artichokes down to the bottoms and cut them in half, but didn’t bother removing the chokes. They needed more cooking time (about 20 minutes) than the frozen artichokes called for in the following recipe. Recipe by Claudia Roden, from THE FOOD OF SPAIN (used with permission). Heat the oil over low heat in a wide casserole, preferably one that you can bring to the table. Add the onion and cook, stirring, until soft. Add the garlic and cook, stirring, until the onion and garlic begin to color. Add the flour and stir vigorously for 1 minute, then gradually add the wine and stock, stirring all the time. 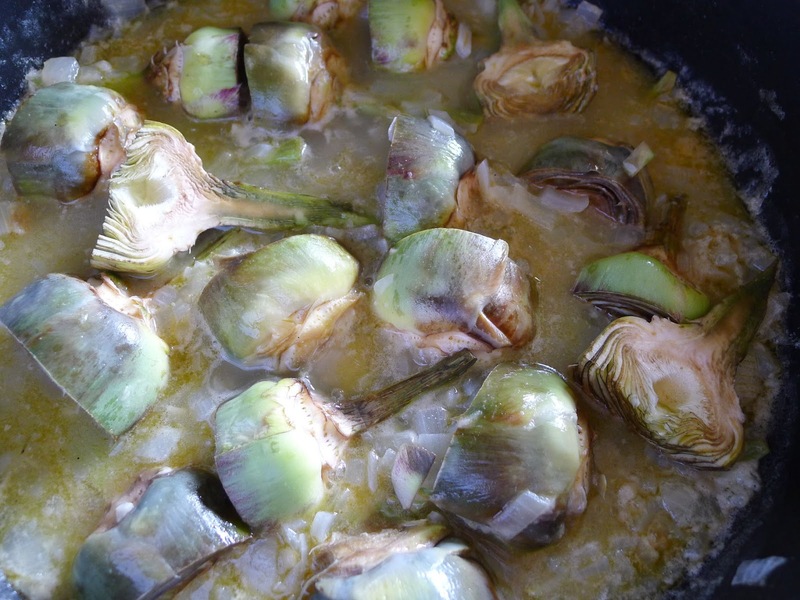 Season with salt, add the artichokes, and cook for 10 minutes, or until they are tender. Put the shrimp and drained clams on top of the artichokes and sprinkle with the parsley. Cover and cook over medium heat until the shrimp turn pink and the clams open. Throw away any that do not open. 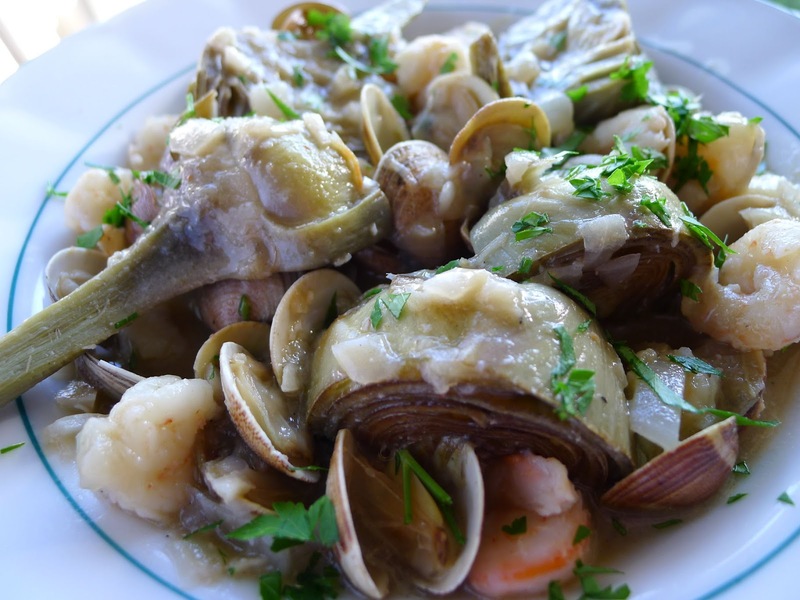 Artichokes with Shrimp and Clams from THE FOOD OF SPAIN. 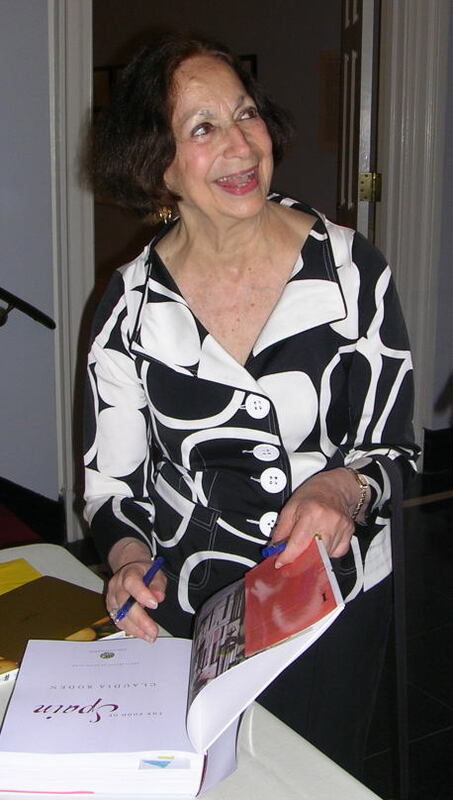 Footnote: Claudia Roden is also a finalist for the James Beard cookbook awards, to be announced on May 4, along with my other favorite cookbook writer, Paula Wolfert, for her THE FOOD OF MOROCCO (also published by ECCO). The photos on this blog are my own, not from THE FOOD OF SPAIN. 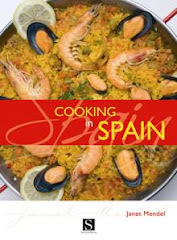 For more on my own books about the food of Spain, have a look at this blog posting http://mykitcheninspain.blogspot.com.es/2011/05/cooking-books.html. 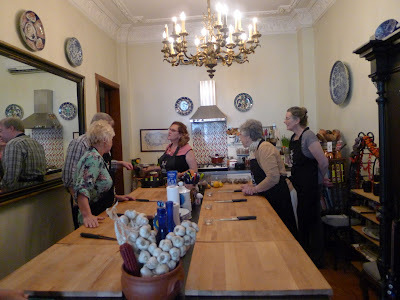 Turkish flavours cooking class with Selin Rozanes in Istanbul. Not MY KITCHEN IN SPAIN, but a kitchen in Istanbul, Turkey, where albondigas are on the menu. Albóndigas is the Spanish word for meatballs.Yes, some people (Sephardic Jews, who still speak Ladino, a version of Spanish) call them albóndigas. Otherwise, they are known in Turkey as keftes. I attended a cooking class in the home of Selin Rozanes in the Istanbul neighborhood of Nisantasi. Selin’s family is Sephardic (the surname Rozanes denotes someone from Roses, the Catalan town where famous chef Ferran Adria had Restaurant El Bulli). Selin teaches classic Turkish cooking, but today she added the albóndigas/keftes and almodrote de kalavasa—zucchini flan, also known in Spain as cuajado—because I was especially interested in the Spanish connection to Turkish food. 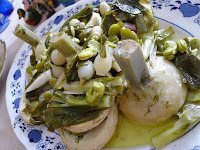 Huge artichokes with dill and onions. For more about Selin’s classes and market tours in Istanbul, see her web site TURKISH FLAVOURS. Tastebuds whetted, now I’m going to order a book about Turkish food written by my friend Sheilah Kaufman, THE TURKISH COOKBOOK, Regional Recipes and Stories. 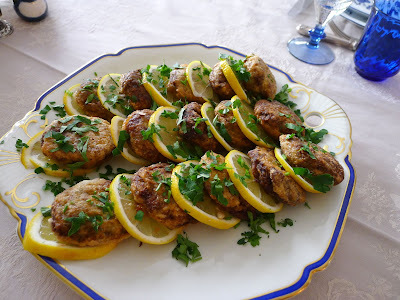 Leek and meat patties--called keftes or albóndigas. Peel the leeks, wash them well, chop and boil them until they are very soft. After they are cooked, drain and press them between your palms as hard as you can to get all the water out. This is very important in order to make the meatballs firm. Put the leeks into the food processor and blend to a soft paste. Mix together the leek paste, minced meat, egg yolks, salt and pepper. Shape into balls about the size of walnuts and flatten them slightly to form 2-inch patties. Dip them in flour. Dip each into beaten egg and lower gently into sizzling oil for shallow frying. Lower the heat, so as not to brown them too quickly, and turn over once. Drain on paper towels and serve hot. 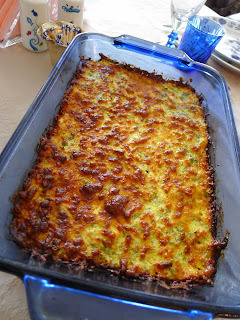 Zucchini flan or almodrote de kalabaza. In the cooking class, we peeled the zucchini before grating it for this flan, then cooked the strips of peel in olive oil with lemon and dill to make a cold dish. In my own kitchen, I prefer to grate unpeeled zucchini. Grate the zucchini. Salt it lightly and let it stand 30 minutes in a colander. Press the zucchini with your hand to squeeze out as much of the juices as you can. In a mixing bowl, combine the breadcrumbs, eggs, feta cheese and grated cheese. Add the oil, grated zucchini, chopped dill, salt (may not be necessary with salty feta) and pepper. Mix well. Pour the mixture into an oiled baking dish (rectangular or oval), sprinkle the top with more grated cheese and bake for 45 minutes to 1 hour, until lightly colored. Serve hot or room temperature. Prettily tinted or lavishly decorated, Easter eggs nestling in a straw basket are a happy feature of the season. Since antiquity, the egg has symbolized new life, thus its appearance at the springtime festival celebrating the Resurrection. Hornazos are eggs baked in bread for Easter. 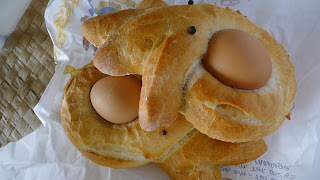 The traditional Easter egg in Spain is not necessarily colored, but is baked in a basket of bread dough—hornazos—or sweet dough—monas de Pascua. These can be found in bakeries at Easter. Jewish custom also includes the egg in the springtime holiday of Passover, when it is one of the symbolic foods served at the seder dinner, representing the temple sacrifice of old. 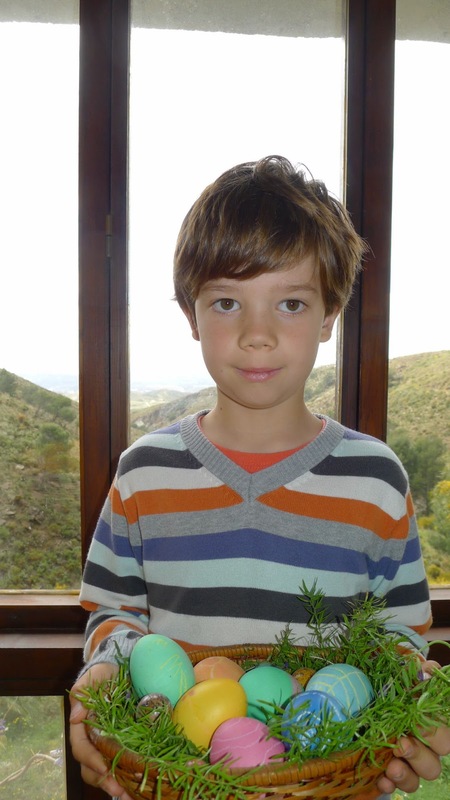 The egg is a highly-valued food in Spain, where many will pay premium prices for fresh, free-range eggs. Many years ago when I lived in the village, I would exchange vegetable scraps with a neighbor (for feeding her pig) for a few fresh eggs. Such a delight. With only eggs, a thousand dishes and enough for everybody. Mas vale un buen dia con huevo que un mal mes con un cerdo. Better a good day with only an egg than a bad month with a whole pig. 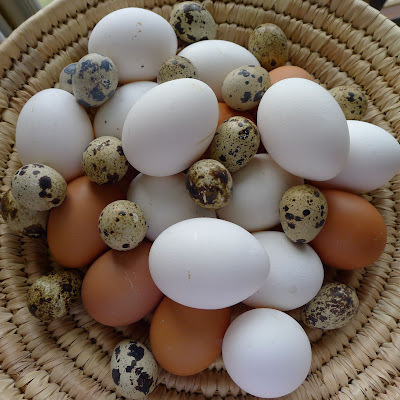 For years, I could never find white eggs and the brown ones just weren’t suitable for coloring. But this year, there they were, just in time for my grandson Leo to help with the tinting. 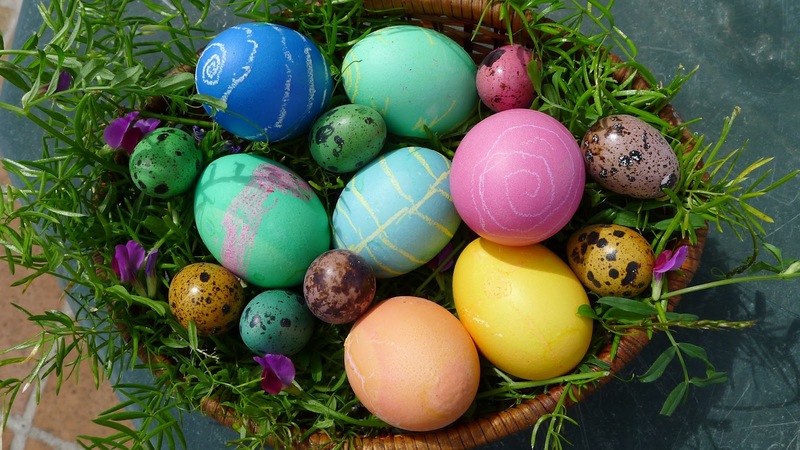 What to do with a surfeit of hard-cooked eggs after the Easter egg hunt? In Spain, sliced eggs in a fresh tomato sauce with patatas fritas, Spanish fries, on the side make an easy and satisfying supper dish. Stuffed eggs are a terrific lunch dish. The Spanish version uses tuna or shrimp in the stuffing (see that recipe here). Or, if you want something a little fancier, try these “double” eggs—they are stuffed, coated with bechamel, then dipped in crumbs and fried. 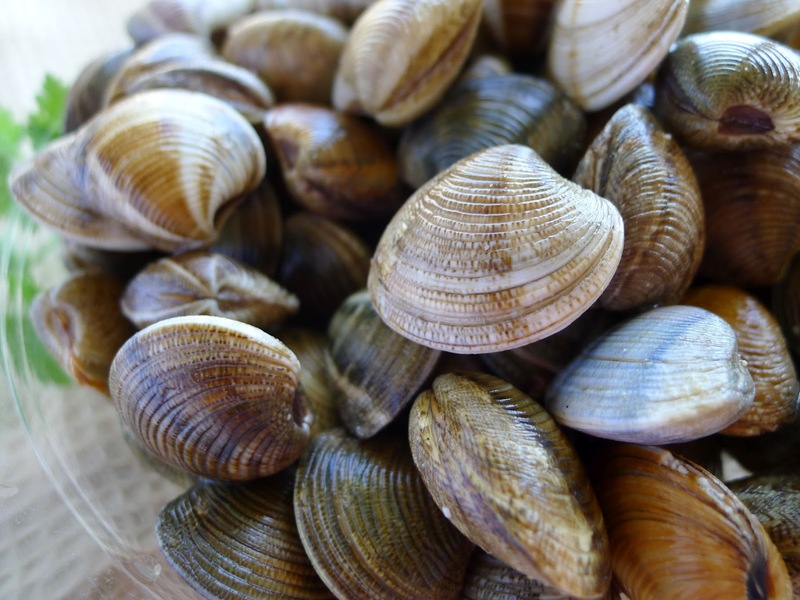 These are fun to prepare (though time-consuming) and fun to eat. 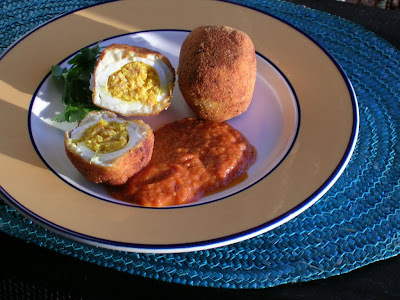 "Double" eggs are stuffed, then breaded and fried. The coating is thicker and crisper if the eggs are dipped twice in flour, egg, and crumbs. 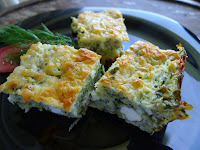 The recipe makes more stuffing mixture than needed for the 6 egg whites. The leftover makes a fine sandwich spread. The eggs can be stuffed and fried up to 24 hours in advance and refrigerated. Bring them to room temperature. Place in an oven pan and heat in a preheated 400ºF oven 8 to10 minutes. Serve the eggs, one per person, as a starter. Tomato sauce makes a good accompaniment. Peel the cooked eggs. Pat them dry. Cut in half lengthwise. Remove yolks to a small bowl. Heat 1 tablespoon oil in a small skillet. Sauté the onion and ham until softened, 5 minutes. Add the contents of the skillet to the yolks. Add ¼ teaspoon salt, caraway seed, mustard, pimentón, and 1 tablespoon of milk. Mash the yolks smooth. Press the yolk mixture into the hollows of the egg whites. Cover a tray with a layer of plastic wrap. Place the egg halves, stuffed side down, 2-inches apart in a single layer. Refrigerate. In a saucepan melt the butter. Stir in 5 tablespoons of flour and stir until smooth over a low heat. Remove the pan from the heat and stir in 1 ½ cups milk very gradually, until the mixture is smooth. Return to a medium heat. Cook, stirring, until the sauce is thick and smooth, 5 minutes. Spoon the hot sauce over the egg halves, napping them smoothly with the sauce. 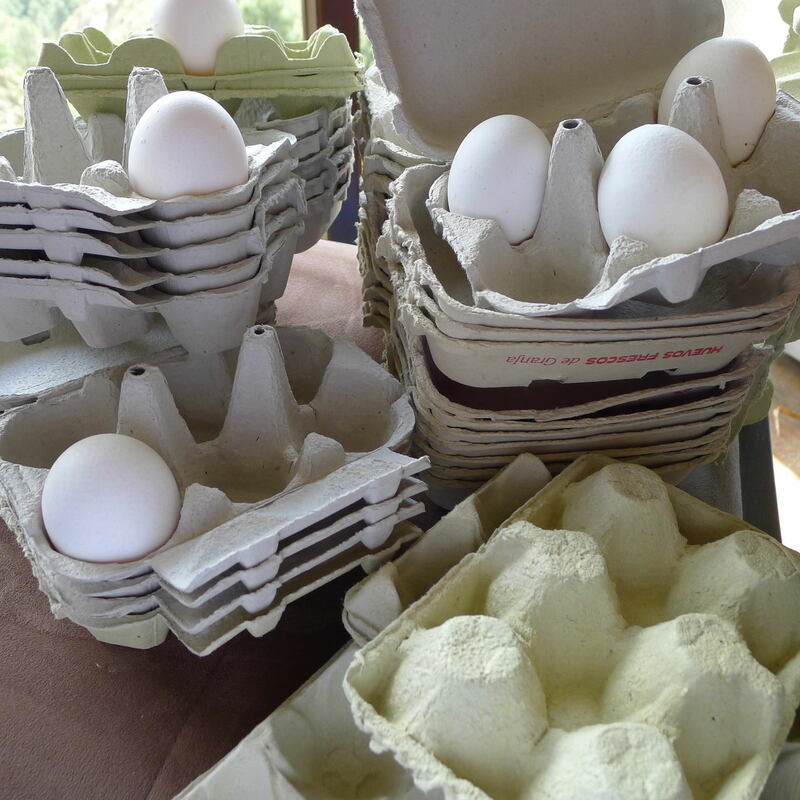 Refrigerate the eggs until coating is chilled and solidified, at least 3 hours and up to 24 hours. Roll one egg half over, stuffing side up. Pick up another egg and place it on top, so the stuffing is enclosed. Repeat with the remaining eggs. Return the tray to the refrigerator. Place flour for dredging in a shallow pan. Beat 1 or 2 eggs and place in a shallow dish. Place half the breadcrumbs in another shallow pan. Dredge each egg in flour. Pat off excess and gently press the two halves together. Roll the eggs in beaten egg. Place them in the tray of breadcrumbs. Sprinkle remaining half of crumbs over the eggs. Roll or pat the eggs so they are completely covered with crumbs. Allow to dry on a tray for 15 minutes. If desired, repeat the breading, dredging the eggs first in flour, then eggs, then crumbs. Heat oil in a deep skillet to a depth of ¾ inch. Fry the eggs, turning to brown all sides, 4 to 5 minutes. Remove with a slotted spoon and drain on paper towels. Serve hot or warm accompanied by tomato sauce, if desired. Leo helped to color Easter eggs.